Ruling Elder Benjamin Harrison was seen doing his normal elder duties that Lord’s Day on March 3, 1889, which was, collecting the morning tithes and offerings in the worship service of the First Presbyterian Church of Indianapolis, Indiana. However, this Christian Presbyterian was no normal elder. The next day, March 4, he would be inaugurated as the twenty-third President of the United States! Coming from a distinguished Virginia family, Benjamin Harrison was the grandson of William Henry Harrison, who was the ninth President of the United States. But William Henry Harrison was in office for just one month, dying on his 32nd day in office from pneumonia. Despite that brief term, the two Harrisons remain the only grand father – grandson relationship in our republic’s history. And adding to their heritage, an earlier ancestor of theirs, Benjamin Harrison V [1726-1791] was one of the signers of the Declaration of Independence. But to return to the ruling elder who became the nation’s 23rd president, this son of an Ohio farmer was born on August 20, 1833. His mother was devout Presbyterian and clearly a major influence in his life. When Benjamin was in his teens, he first studied at Farmer’s College, but soon transferred to Miami University in Oxford, Ohio, where he graduated with high honors. It was there that he met his future wife, Caroline, whom he married not long after graduation from college. In 1854, he and his wife moved to Indianapolis, Indiana and joined the First Presbyterian Church. It was said of him that “he was constant in attendance at church meetings, with his voice often heard in prayer meetings.” Further, whether in public or in private, “he gave testimony of his faith and affirmed the Lordship of his Master.” He was to serve as a Sunday School teacher, then as a Deacon, and finally as a ruling elder. His fledgling career as an attorney was interrupted by start of the Civil War. Entering the 70th Indiana Regiment as a Second Lieutenant, he served faithfully, ending the war as a brevet Brigadier General. His spiritual testimony was not lost during this time. His letters to his wife asked her to pray that he would be a good soldier of Jesus Christ, that God would give him valor and skill in the conduct of his life. Indeed, nightly prayer meetings were held in this Union officer’s tent. He is noted has having served in the Atlanta campaign of General Sherman. Entering the political fray back in peacetime, he believed that his election to the presidency was due to divine providence. Daily prayer was held in the White House before any and all national business. He would go to be with the Lord on March 13, 1901. 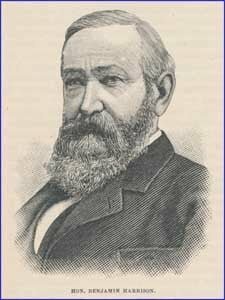 Benjamin Harrison wrote once, “I hope that you will renew your Christian faith and duties. It is a great comfort to trust God, even if his providence is unfavorable. Prayer steadies one when he is walking in slippery places.” In this 2016 election year, let us pray that, in the midst of election politics by political parties and candidates, we will recognize that all will eventually play out due to divine providence. Further, fervent prayer still steadies His children when we live in and through slippery times. Let us rest content in that biblical truth.